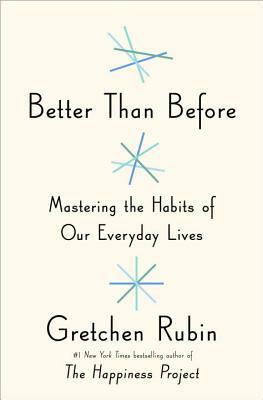 Description: Gretchen Rubin of The Happiness Project is now turning her eyes on the habit of habits. Why do some habits stick but others don't? And what can we do to make better mindful decisions regarding our own habit development. Why I Picked This Book: While I was underwhelmed with Rubin's 2nd book - Happiness at Home - I did get quite a bit out of her 1st book. I was curious to see what she had to say on the subject of habits. My Impression: As I would expect from Rubin, Better Than Before is meticulously researched and at times almost painfully so. It took me a chapter or two to get connected to the book because of all the studies and theories that she quoted. But once she started talking about the different types of motivators I was intrigued and became fascinated with the concept. She asked a lot of questions that really made me think about my own actions and what motivates me as well as questions that made me evaluate my priorities. I really liked that this wasn't a list of suggestions I should incorporate into my day but more of a framework to decide what I wanted to add to my day and than figure out the best way to go about it given my personality and motivations. She frequently ended the chapter with a list of questions so that the reader can better figure out how the chapter applies to them. This isn't an easy warm blanket and cup of tea read. This is a read you need to do with a notebook at hand so that you can take notes and make reminders. Rubin doesn't come across as likable and with as many times as she mentions lecturing her friends for clutter or staying up to late I'm kind of relieved that I don't know her personally. However, this isn't a book where I had to like the narrator. I respect her opinion and her reasoning makes a lot of sense. I look forward to focusing on my own habit creation and becoming better than before! My one concern is that through reading this book I realized that I'm what Rubin considers an Upholder which is her motivator as well. Since the methods that apply to Upholders apply directly to her it did seem to focus a bit more on that type. I do question if the book would be quite as useful to someone of the other motivator types. Would I Read More of this Series/Author? : Yes, I actually need to reread this one with my notebook and pen! Would I Recommend this Book? : Absolutely! If you have any interest in changing aspects of your behavior or understanding your motivations more I think this would be a valuable resource. I wouldn't like to be her friend either ;) But I'd like to have a look at this book - with notebook and pen too ! You definitely need to take notes. She's definitely not someone is like to meet for coffee but so far I've found her advice spot on. I'd like to read this too. I listened to a book about habits a couple years ago (The Power of Habit by Charles Duhigg) and thought it was fascinating. This might be a good follow-up. I found this really interesting and I'd love to see how this compares to the other book. This is heavy on explaining motivations versus specific advice. I want to read this one or listen to it. I'm on a quest to determine why I seem to have such a problem making habits in one direction but not in others. Anyway, this one sounds good. Thanks for sharing it! This would definitely be the book for you. It was one of those that I kept saying "that's it exactly!" As I was reading it. I wonder if I can get an audio for this. It looks like something I'd like listening to in the car. I know my library has it in audio so hopefully you'll be able to hunt it down. I read her first one when it came out and rather enjoyed it. I sometimes visit her website, she is fairly driven, I doubt I could ever keep up with her. I was wondering about this book so alighted on your review with interest. I like the idea of questions at the end of each chapter, sounds good. I really enjoyed her first book but the intensity of the blog didn't quite work for me. I found this book really useful and hope you so to! This one definitely does! I should've taken notes on the first read! Sounds interesting, worth a look, especially if recommended by you! I'd like to hear your take on her writing habits. I feel like I got a lot out of this one! I read The Happiness Project last year and really liked it, so I think I'll add this to my list for this year. I think if you liked The Happiness Project I think you'd really like this. This felt like a good companion to her first book. I'm curious about the various types of motivators. Sound like very interesting ideas. I did fin this really interesting. I was curious with how she would treat this topic and wasn't disappointed. I am externally optimistic. The hubby thinks I fart sunshine. So I tend to motivate myself easily...oh plus the fact that I will do anything for coffee. I enjoy reading these type books and gaining insight into myself and others. I'm the optimist here as well though maybe not to the farting sunshine level. I thought this was really useful! Thanks for stopping by my blog! I have not read The Happiness Project but this one sounds really good, especially the exploration of motivators. Since you mentioned you enjoyed books where characters find their strength you might pick up Driving Lessons and The Transformation of Things, both of which I really enjoyed last year. I will look for both of those books! I love the finding strength books. I really enjoyed The Happiness Project. It helped me reevaluate how I was spending my time and made me think about what hobbies I really enjoy. The good thing about this book is it's more about understanding than changing but I could see this not be for everyone! I really really want to read this one. I think habits are such important drivers of our every day. I want to rework so many of mine - especially my morning habits. I definitely could use some reworking of my morning! I really looking this one useful. I haven't actually put any to work but I think it'll be useful! I just started reading this and I'm enjoying it so far. I'm so obviously an obliger it's not even funny (and just as she said in the book, this is not something I like about myself). I will have to see if the fact that she writes a lot about Upholders bothers me at all. This sounds interesting and useful; learning more about motivations would be a useful thing indeed. Good to know she's hard to warm up to. I wonder of my library has this.